Hi there! I think I have found a new addiction. This time not a jewelry-piece addiction, but a print-addiction. I figured that I’m always attracted by jaguar prints. It is some kind of eye catcher for me. I love jaguar prints, but I’m very selective. I think that jaguar printed clothes or bags or shoes can easily be vulgar. I mean, it must be a subtle, fragile print, not a common one. For a while now I have been fascinated by loafers. 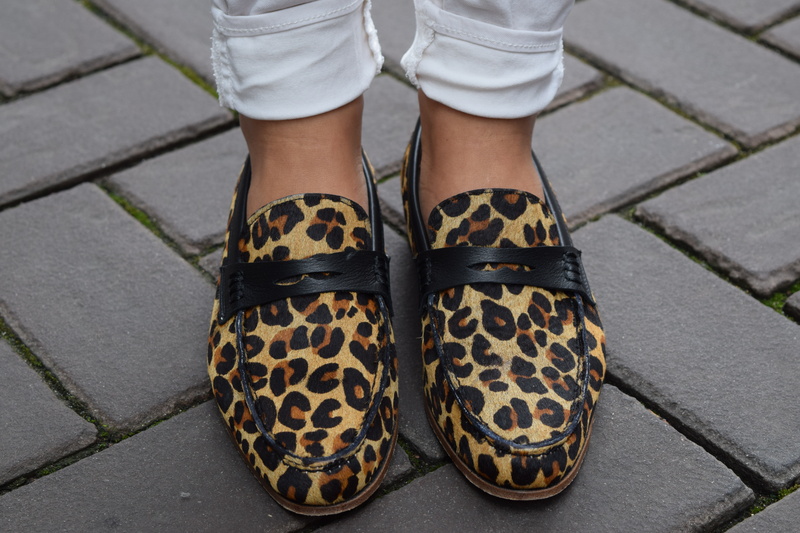 Everywhere I look I see all kinds of super awesome and beautiful loafers and I have been wanting those kind of shoes for such a long time! But I couldn’t find the perfect ones, or I thought they didn’t fit me well enough. I always had some reason why I shouldn’t buy them, I’m very selective and very critical. The ones I wanted the most were the ones Miranda Kerr wore. They were perfect to me. And I think now I have found my precious: my new Lady Paris Wild – Jaguar! When I found out about this upcoming brand I was immediately in love. O’Quirey was founded in 2006 by the Dutchman Jan Palmen and the shoes are all handmade in Portugal. The shoes are made of hairy cow leather and they have a leather sole. I think they are so luxury! They have, beside all kinds of magnificent loafers, also a lot of other shoe models. I am sold! What I love the most about them is that you can wear them with everything! They are cute with a little dress, bold with some boyfriend jeans, classy with a pair of nice skinny jeans and a tidy blouse. Isn’t that great?! And they walk like heaven. You do have to break them in first, but when you have, they walk perfect, due to the perfect fit and the perfect choice of materials! My summer closet is definitely shoe-complete with these jaguars!